Hookey is a fun and exiting outdoor game that is being played in many backyards around the world. This is a ring toss game that attaches to your wall and is similar, but different and safer than darts. A great edition to your patio that can be left up all year round. This outdoor toss game is a family favorite that can be played with 2 to 4 people by people and skills of all ages. 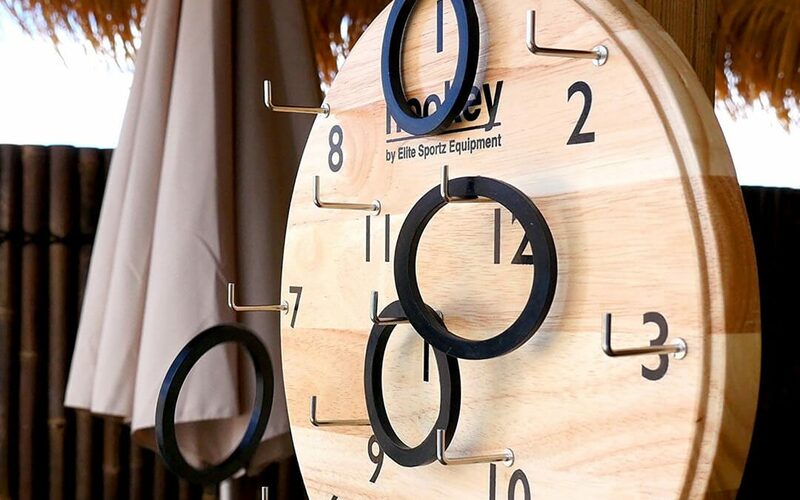 The Hookey Toss game attaches to your wall and has 13 numbered hooks that you throw your rings onto. It is simple but challenging game that develops hand-eye coordination that is very addicting. Here is our review and rules for the Hookey Outdoor Ring Toss Wall Game. To play Hookey Ring Toss, first you need to setup the game. Hang the game on a wall and start playing. We suggest hanging it somewhere on your patio that you can leave up year round. The objective in Hookey is too see how many of the rings you can throw and land on the hooks. There are 13 different numbered hooks all with different values. Each person takes turns throwing the 6 rings each and afterwards tallying up their score. There are different variations of the rules but to win the game is normally first person to reach 101 points. Time to gather all the neighborhood kids and the family because this is one of those games that will game that will be your challenge to master. Once you have hung your Hookey set to the wall, the rules are simple and easy to learn. Here are the official rules, keep reading for alternative rules you can also test out. 1. Decide the throwing order for each player. Each player takes turns throwing their 6 rings and the highest point total starts first and others follow in that order. If you are playing with 4 people, each team gets 3 rings each. 2. Create the throwing line for which you can not cross. I would suggest 6 or 9 feet away depending on the skill level of the players. 3. Each player throws all their 6 rings one after another. After this the rings that land on the hook will be counted as their score. 4. If all 6 of the rings one player throws lands on the hooks they get another bonus throw. 5. The first player to reach the 101 points and not going over wins. If you do not get the exact number and go over, then your throw does not count and will need to wait again until your turn to throw. One of the things I like about Hookey is that there are different ways you can play the game. Normally you play to land on the exact number such as 101, and this may be too quick or too long for many of us. My personal favorite variation is like round the world in darts. As there are 12 different rings in Hookey the point of this version is to land on all hooks from 1-12 number in order. Make up your fun variations such as seeing who can reach 50 first using the fewest rings. Hookey Ring Toss is one of the backyard games that that you should be adding to your collection. It is not an active game but is one that is fun for groups and people of all abilities. It can be played in your backyard, camping, or even to your office. Besides the rings that attach into the board the game is very sturdy and well designed. We used some glue to attach this, but from the reviews I see this is as problem that the Hookey team has fixed. This is not just a kid’s game we played this at an adult birthday party as well and was the hit of the party. Also featured in our Ultimate List of 63 Outdoor Game list. Click here to Buy Hookey Online. Game description: The Hookey Ring Toss is like darts for so much better and safer. 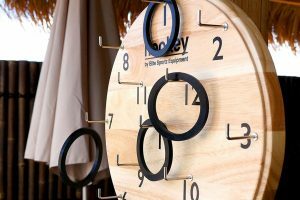 The Hookey Outdoor Ring Toss Wall Game is perfect outdoor game for kids and adults.